many Mari default nodes can use (Triplanar etc.) in their Calculation, when attached to their 'Normal' Handle in the Nodegraph. It provides a way to make Mari aware of fine details and surface normals from highres models, when working with lower res geo. On the left the normals generated with a 'Surface Normal' Node on a lowpoly model. 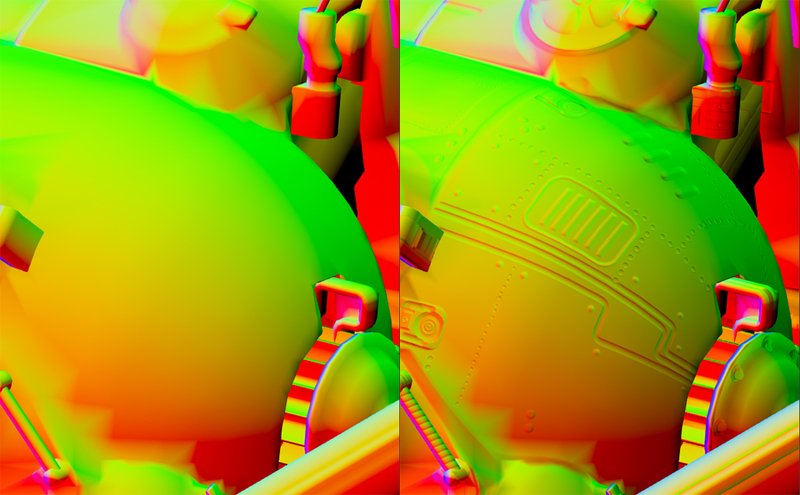 On the right the normals generated with the 'Tangent to Surface Normal' Adjustment over a Normal Map. Flips the Red/Green Channels of the Normal Map before any computation is done.